Clin Cancer Res, 2016, 22(4):1018-27. Capivasertib (AZD5363) purchased from Selleck. G-H. Analysis of cells treated with AZD5363 (500 nM) for 24 hrs. G.Western analysis of whole cell lysates. H. Cells labeled with Annexin V-FITC for 6h were imaged. Individual points are average for replicates assessed in duplicate. Midlines are the average ± S.D. Student’s T-test. Cancer Res, 2016, 76(16):4752-64.. Capivasertib (AZD5363) purchased from Selleck. Inhibition of PI3K and Akt by LY294002 and AZD5363 was confirmed by analyzing expression and activation status of the ribosomal protein S6 by Western blot analysis of PC-3 clone #14 cells treated with 0.5 or 5 uM AZD5363 (AZD) and 10 uM LY294002 (LY). Tubulin was used as a loading control. 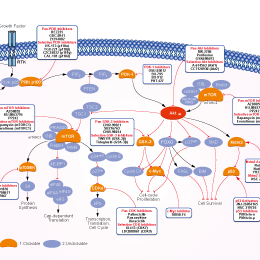 Cell Commun Signal 2014 12(1), 61. Capivasertib (AZD5363) purchased from Selleck. J Neuroinflammation, 2017, 14(1):228. Capivasertib (AZD5363) purchased from Selleck. (A) 239 cells stably expressing Flag-IL-17RA (293-IL-17RA cell line) were treated with 2 μM AZD5363 (a pan-Akt inhibitor) and/or 50 ng/ml insulin for the indicated time periods; Western blot analysis was performed for the indicated proteins; exogenous, IL-17RA transfected into 293 cells; endogenous, endogenous IL-17RA expressed in 293 cells. Oncotarget, 2016, 7(12):13651-66. Capivasertib (AZD5363) purchased from Selleck. LNCaP, LNCaP95, VCaP and 22Rv1 cells were transfected with control or pooled siRNA for AKT 1–3 isoforms for 36 hours. Cells were then further treated with 5 uM AZD5363 (B) for another 18 hours. Protein lysates were immunoblotted with AR (N-20), AR-V7, Pan-AKT, p-AKT(ser473) and β-Actin antibodies. Results were repeated in more than three independent experiments. PLoS One 2014 9(10), e108780. Capivasertib (AZD5363) purchased from Selleck. Addie M, et al. J Med Chem, 2013, 26. Davies BR, et al. Mol Cancer Ther, 2012, 11(4), 873-887. GSK690693 : Akt1, IC50=2 nM; Akt2, IC50=13 nM; Akt3, IC50=9 nM. 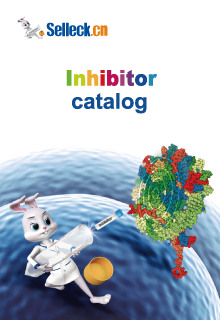 MK-2206 2HCl : Highly selective inhibitor of Akt1/2/3 with IC50 of 8 nM/12 nM/65 nM, respectively; no inhibitory activities against 250 other protein kinases observed. Phase 2.